↑ "Chris Benoit profile". Slam Wrestling. 喺2007-06-28搵到. 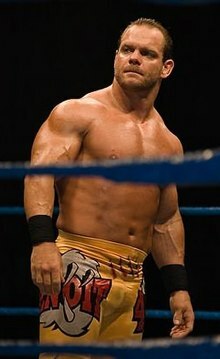 ↑ "WWE Wrestler Chris Benoit and His Family Found Dead". Associated Content. （原先內容喺2007-06-30歸檔）. 喺2007-06-28搵到. ↑ "WWE Canadian wrestler Benoit, wife and son found dead". Toronto Star. （原先內容喺2007-06-30歸檔）. 喺2007-06-28搵到. ↑ Doug Lunney (2000-01-15). "Benoit inspired by the Dynamite Kid, Crippler adopts idol's high-risk style". 喺2007-05-10搵到. ↑ 6.0 6.1 "WWE postpones show at American Bank Center". Caller-Times. June 25, 2007. 喺2007-06-25搵到. ↑ "Web Time Stamps Indicate Benoit Death Reported About 14 Hours Before Police Found Bodies" 互聯網檔案館嘅歸檔，歸檔日期2008年5月17號，.FOXNews.com, June 28, 2007. ↑ "Anonymous poster comments on Wikinews". ↑ Police: Wiki Confession an 'Unbelievable Hindrance' ABC News, June 29, 2007. Kevin Dunn (Director) (2004). Hard Knocks: The Chris Benoit Story (DVD). WWE Home Video.